Fall means pumpkins, spices and squash! These beauties are everywhere, and there’s so much variety between each kind. Spaghetti squash is stringy and a fun substitute for pasta, Butternut is great with curry or as soup, and Delicata can be baked, skin on and everything, to make mock-fries! Today, though, I decided to use my Delicata as a boat/bowl for my colorful salad. Delicata, when roasted, has a slightly sweet and nutty flavor; the perfect combination of sweet and savory. It’s much less sweet than Butternut and Kabocha, which is what I wanted because of the sweet elements going into my salad. I used Asian pear and pomegranates for sweetness to off-set the spicy arugula and tangy goat cheese. Squash really isn’t as intimidating as it looks, provided you have a sharp knife. You can pretty much just cut into them, remove the seeds and roast! It’s a more nutritious and lower-carb option than rice, pasta or potatoes, and it fills you up just as well. Plus, they just scream cozy, fall, happy, sweater-weather, hot cocoa and all the other things we love about this time of year! So if you haven’t made them a staple yet, it’s time to give it a shot! Slice both squashes longways and remove seeds with a spoon. Place in a baking dish, flesh side up, and coat generously with cooking spray. Sprinkle on salt and pepper. Place in a cold oven, then set the temperature to 450°. Set timer for 18-20 minutes, and roast until insides are soft and caramelized. Remove and cool. Whisk together the vinegar, syrup and oil. 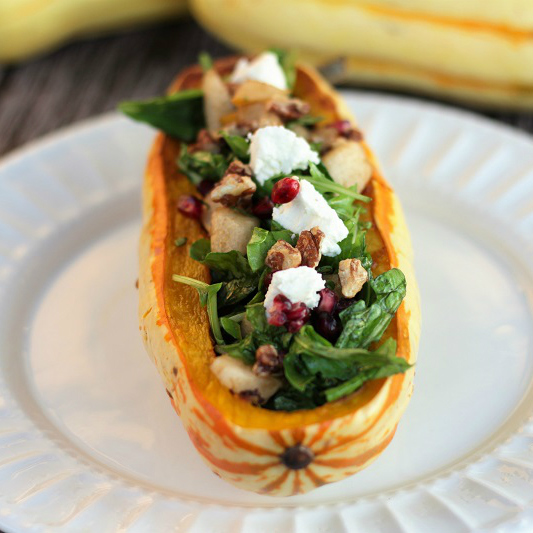 Toss in a large bowl with arugula, pear and pomegranate. Fill each boat evenly with salad, and top with cheese and pecans. Which type of squash is your favorite? Let me know down below!